Since we adopted Bob, She has come along way in her new life. Remember, she wouldn't eat plants or veggies, strictly pellets. Those days are gone. She now loves all types of greenies, water plants and even an occasional rosie red once in a while (though she waits till Sheldon is finished for these). 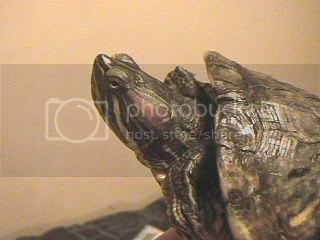 Her shell has improved immensely as has her social skills (what they are for a turt..lol). She now begs just as well as Sheldon and loves to be held and petted (used to snip at ya before). This is her shell today. If you notice, the bright orange areas are now gone and a beautiful new shell is emerging underneath. Her coloring is back around the edges as well. She even has some SHINE to her...she's not 100% yet but she's getting there. More of her shell today. Even her ear coloring is brighter than before. She's making a great comeback. 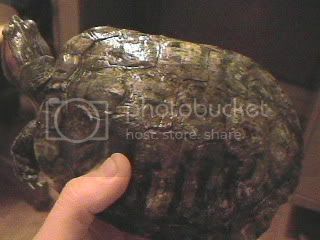 Looks good to me too, what are you using to treat her shell? I have used nothing except change her diet..
She ate nothing BUT pellets...no veggies, no greens, no nothing. I also gave her a floodlight for basking and a UVA/UVB light. She now eats Anacharis, Romaine lettuce, Hornwort, carrots (once a week), Collard Greens, Turnips and Mustard Greens. Was getting alot of Hyacinths but now that the season is over, I can't supply anymore of those till next spring. Why do you ask? Something else I should be doing for her? We were thinking maybe she was highly neglected in her previous home. 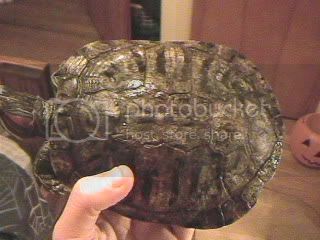 She was missing nails (which are now growing back), her shell was heavily pitted (now its smoothing out) and her diet was all wrong. She's still small for her age but she's grown 1" in the last month (tells me something must be going right). She was NOT a happy turt when we got her. She was very snappy and had to be placed in a towel in order to even move her anywhere. Now she actually comes to you and expects to be picked up...no more hiding either. She made friends with Sheldon and since Sheldon is a much younger turtle, i'm thinking the effects of her worn off onto Bob. She's looking better! I'm seeing some air trapped under some skutes... That shell's going to look great when she sheds. Good Job! I bet she is so much happier with you. I hope that she continues to do better! Her shell looks a lot better! 8 RES: Tampa, Bay, Exclamation (Male R.I.P. 2-10-07), Question-mark, Tiny Tim, Pan Handle (Male), Squirt, & Crush. I'm so glad she's doing better and has found a loving home with you and Sheldon. 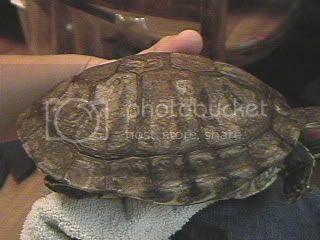 She is shedding a wee bit everyday of her shell..not big sections at a time but thin layers here and there. I think she's looking great. I'm happy to see her shine returning as well.